Although many viewers may be feeling “no más” to the prospect of another boxing movie, Jonathan Jakubowicz’s Hands of Stone (A-) turns out to be stunningly good and one of the most unexpected character dramas of the year. The film is a sports biopic about the career of Panamanian former professional boxer Roberto Durán, and he is fiercely portrayed by Édgar Ramírez in one of those performances that defies every expectation. His brute deconstruction of machismo, his hunger for victory and justice and his nationalistic zest for life seeps out of every frame. The character is often hard to like, and that makes it even more intriguing. 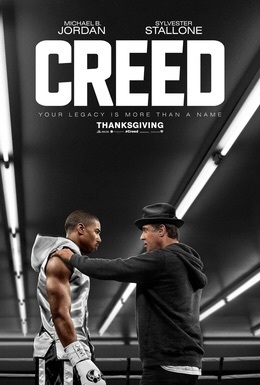 Through superb period detail and art direction against a backdrop of a revolutionary time period in Panama paralleling a transformation in the boxing industry through television and sponsorships circa late 70’s and early ’80s, the filmmakers create a soaring narrative that turns the tables for American audiences expecting to root for their native son. Usher Raymond is a delight in a small part as U.S. boxing hero Sugar Ray Leonard, conveying magnanimous authority. Ana de Armas is remarkable as Felicidad Durán, imbuing the spouse role with grace and verve. Magnificent in other supporting parts are Ellen Barkin and Rubén Blades, the latter legend contributing mightily to the soundtrack as well. But it is Robert De Niro who reclaims his mantle as one of the cinema greats as champion trainer and narrator Ray Arcel. He is splendid in the supporting role; and like Ramírez, you can’t take your eyes off him. De Niro’s corner of the ring pep talks with the Panamanian boxer are part inspiration, part confessional and part master class in quiet dignity. Whether you love sports movies or actively resist them, you will find this story – and the style of telling it – captivating. 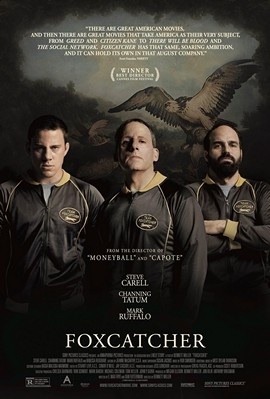 Bennett Miller’s Foxcatcher (B+) is an absorbing true crime drama featuring spot-on performances by Steve Carell as a paranoid multimillionaire obsessed with being an Olympic sports coach and Channing Tatum and Mark Ruffalo as gold medalist wrestlers grappling with the limits of loyalty to their wealthy patron. A commentary on how power, wealth and influence can be used to advance twisted values, one can’t help but think of Michael Jackson or Joe Paterno scandals as Carell’s John du Pont manipulates the world around him to support his megalomaniacal desires. Miller creates an austere and often bleak portrait with nary a false note and an underlying tone that traps viewers into an off-kilter lust for power without boundaries. Carell creates a fully unsympathetic portrait, and Tatum and Ruffalo physically and emotionally inhabit their roles with deft skill. Bennett builds on the autumnal tragedy he brought to Capote and the slackjawed sensationalism of sports drama Moneyball to create another modern-American stunner. Director Craig Gillespie’s true sports story Million Dollar Arm (B-), isn’t likely to please viewers eager to see the thrills of athleticism on the screen (heck, even Stallone’s arm wrestling movie racks up more credibility on that scoreboard); but after a lethargic start, this formulaic film finds its footing as a surrogate family drama and a bit of a redemption tale about a fallen sports agent getting a second chance. Jon Hamm’s search for new baseball pitching talent from cricket players in India and the subsequent fish-out-of-water training and scouting in California and Arizona hold only modest suspense or intrigue but are rendered enjoyable by the considerable charms of Madhur Mattal and Suraj Sharma. Lake Bell is also a pleasant presence as the tenant in Hamm’s carriage house who may just hold the key to his steely heart. Hamm and ensemble are batting average until some fairly nice travelogue moments abroad and a late-reel rally of sentimental delights. There are no baseball games in the movie and no credible training montages – just lots of fast throws for velocity points. This hardly adds up to riveting cinema. Mostly it’s a lesser mash-up masala of Jerry Maguire, Moneyball and Mr. Baseball. Although only sporadically successful, the film has just enough contemporary edge and international flair to push the Disney brand forward just a bit while still providing a safe bet for family viewing. The man who played America’s top gun, a cocky race car driver, an acrobatic bartender, a brooding vampire and a covert operator is now on the sidelines as Tom Cruise plays the agent behind the sports superstars. Cameron Crowe’s Jerry Maguire (A) is about a man who comes down to earth and discovers what truly matters when he finds romance, discovers a sort of surrogate parenthood and finds a client who can count on him regardless of his prestige. To paraphrase a famous line, the film “had me at hello” with superb performing performances by Renee Zellweger and Cuba Gooding Jr. as the agent’s loyalists. Crowe uses lovely pop music including Bruce Springsteen’s “Secret Garden” to trace the emotional and romantic journey. Cruise has never been better and gives one of his most restrained and generous performances.